Salt won the pitch to transform the interior spaces at the Folkestone Quarterhouse during the 2015 Folkestone Book Festival. 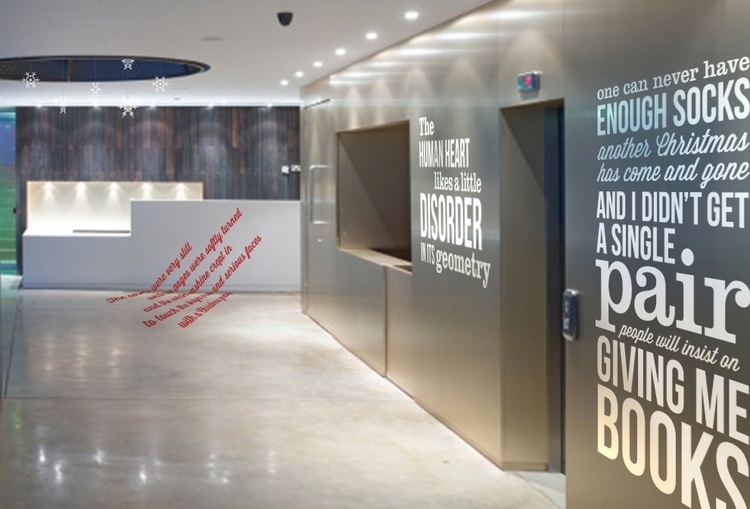 Inspired by our love of books and print the centrepiece of the concept was a four metre high installation of bespoke paper cut type and snowflakes hanging from the double height ceiling through to the foyer below. Quotes from favourite books appeared in unexpected places to lead visitors into and around the venue. A paper cut festival poster featured letters opening like doors on a giant advent calendar and a set of four typographic screen printed posters were commissioned as mementos of the event. The result was a welcoming environment appealing to everyone from the celebrity speakers to local school children. Most elements were designed to be reusable and we achieved our aim of using local artists and suppliers for the bespoke and crafted production. See more on our blog. The project has been shortlisted in two categories for the Kent Creative Awards 2016. Stella and Victoria's initial ideas encompassed the brief and at all stages and there was excellent communication and we worked together to problem solve within the limitations of the space and budget. The finished outcome transformed the space beautifully and was well received by our audiences. It was a complete pleasure to work with Salt. I loved the decorations, I thought they were very festive, original and elegant. They were definitely a great addition to the Quarterhouse. I do hope we work again with you in the future!